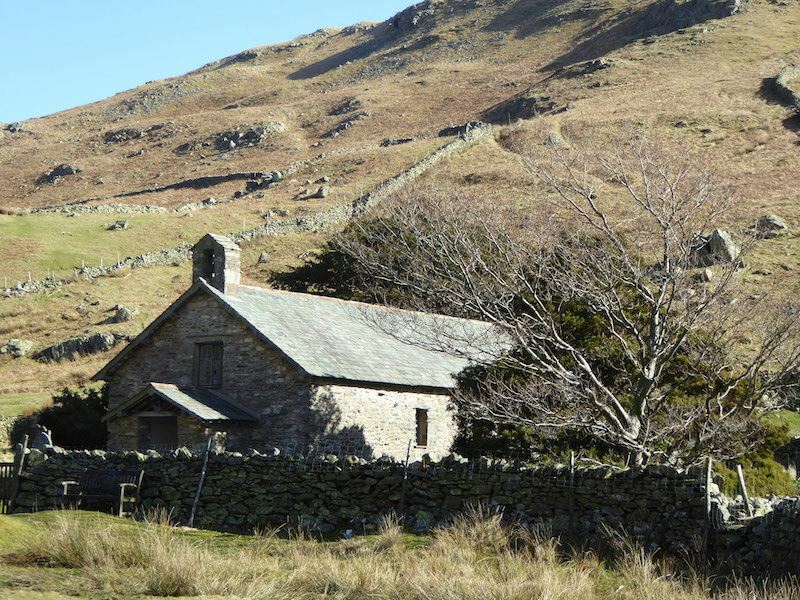 Its a gloriously sunny, blue sky day as we park up by the ‘old’ church of St Martin in Martindale. 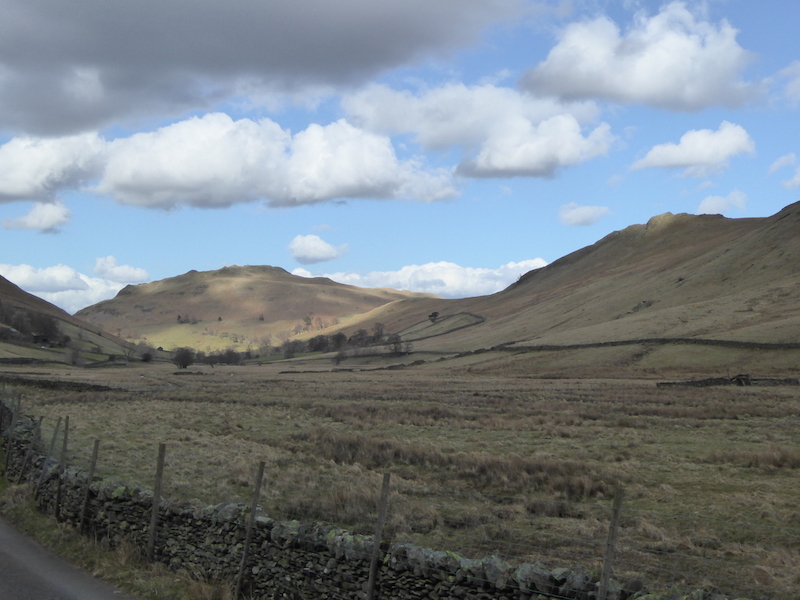 Looking over to Beda Fell from the roadside. 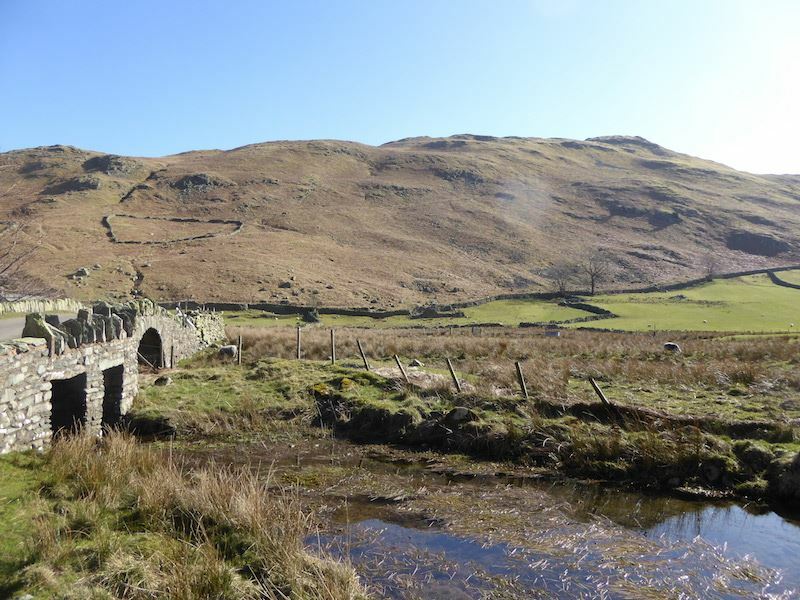 There’s a path snaking up the fell side through the dead bracken over on the left, but we’ve used that one before, today we’ll be turning right beyond the bridge and taking the path from there up to \Winter Crag. 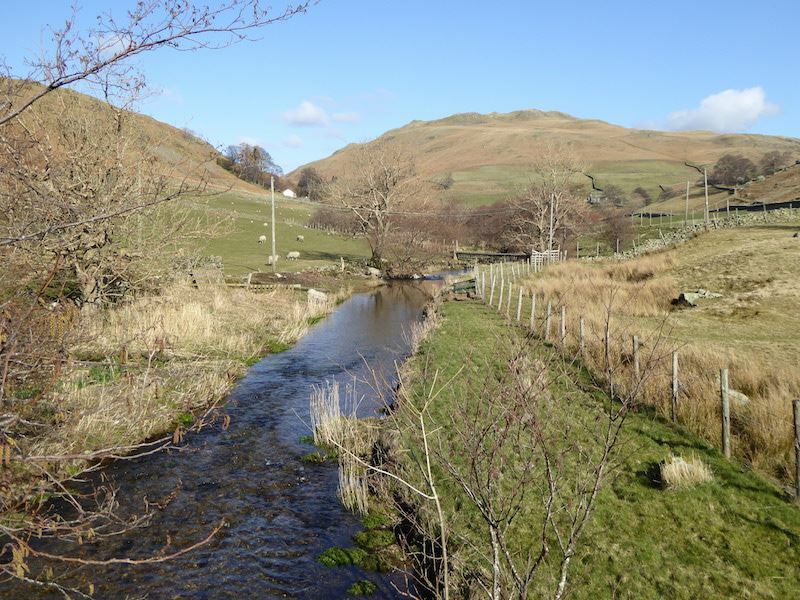 The Nab just behind the slopes of Beda Fell as we walk towards the bridge. 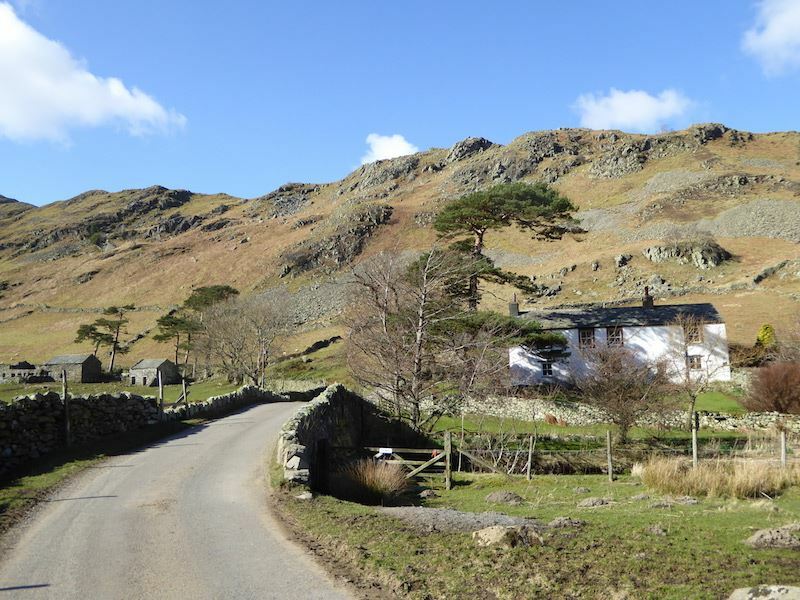 Approaching Christy Bridge and the Winter Crag farmhouse. 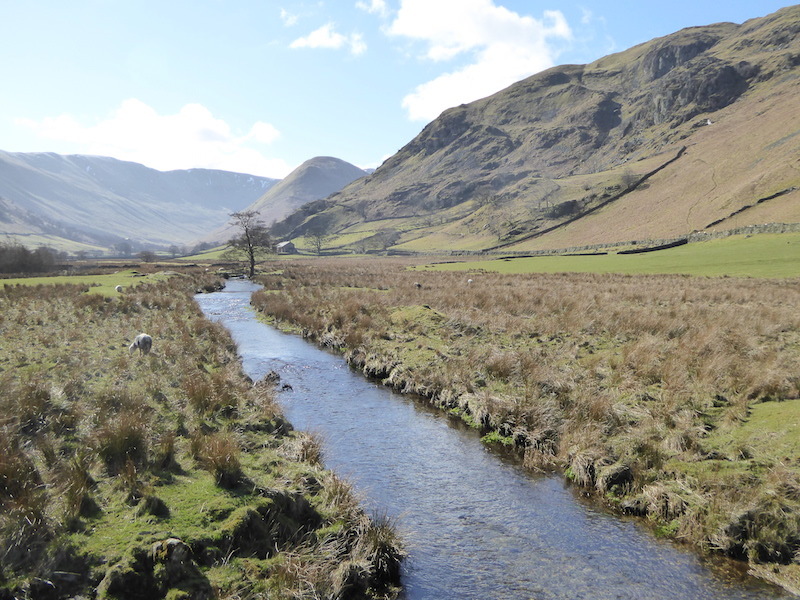 Howe Grain Beck and a view up Martindale. Howe Grain Beck, but this time looking the other way for a view of Hallin Fell. Steel Knotts across the valley. 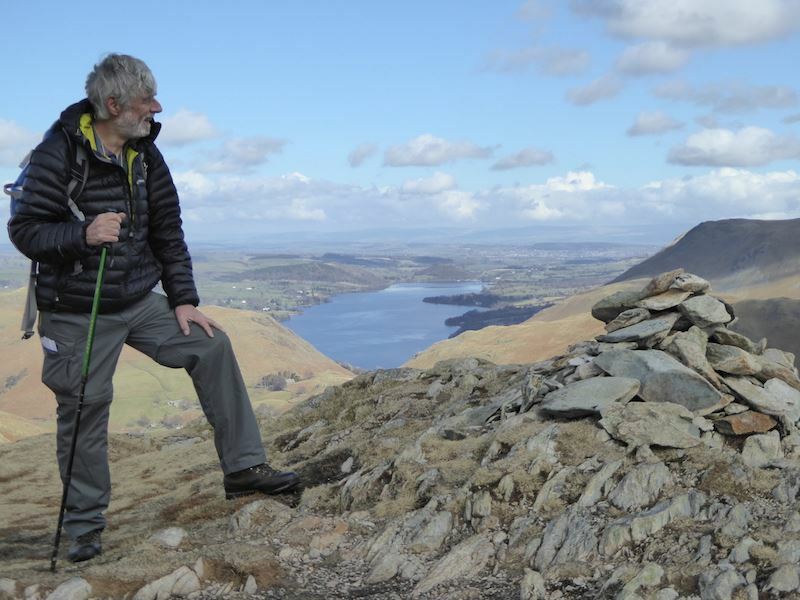 A little higher up and more of Hallin Fell comes into view. 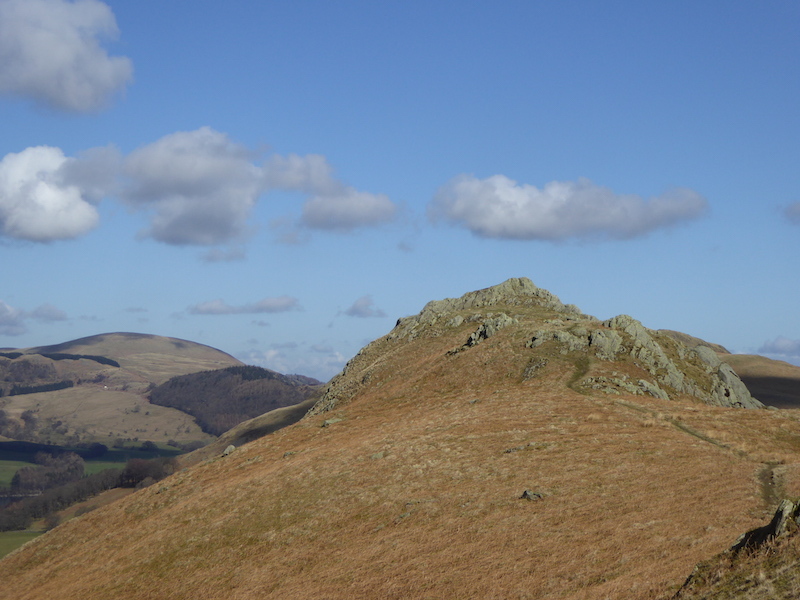 Over on the right, from front to back, are Steel Knotts, Bonscale Pike and Arthur’s Pike. 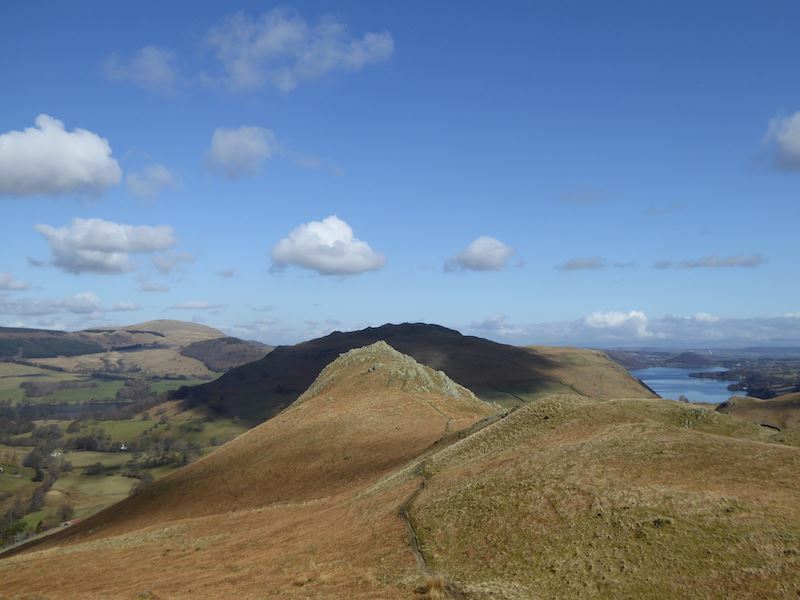 We’re up on the ridge line now and looking over to Gowbarrow Fell, with just a glimpse of Ullswater beneath it. 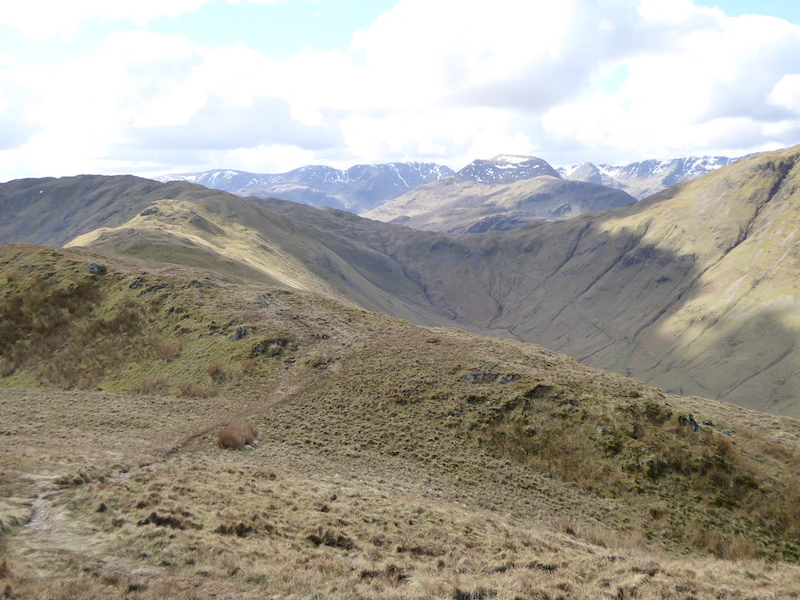 From the ridge there’s a view into Boredale with Place Fell on the right, we’ll be returning by that route later on. Seeing as someone had been kind enough to provide it, it seemed a shame not to put it to good use. 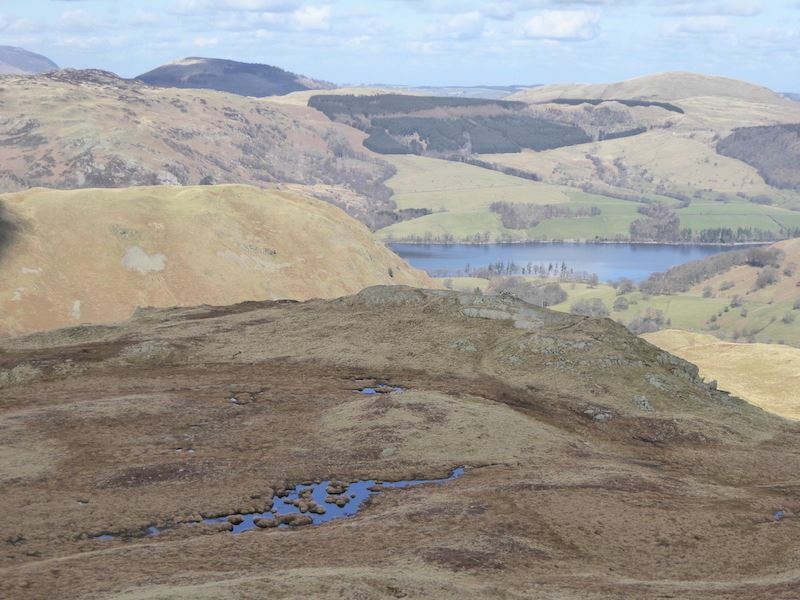 Looking across to Hallin Fell on the centre skyline, with a little of Ullswater showing to the right of it, and Little Mell Fell to the left. 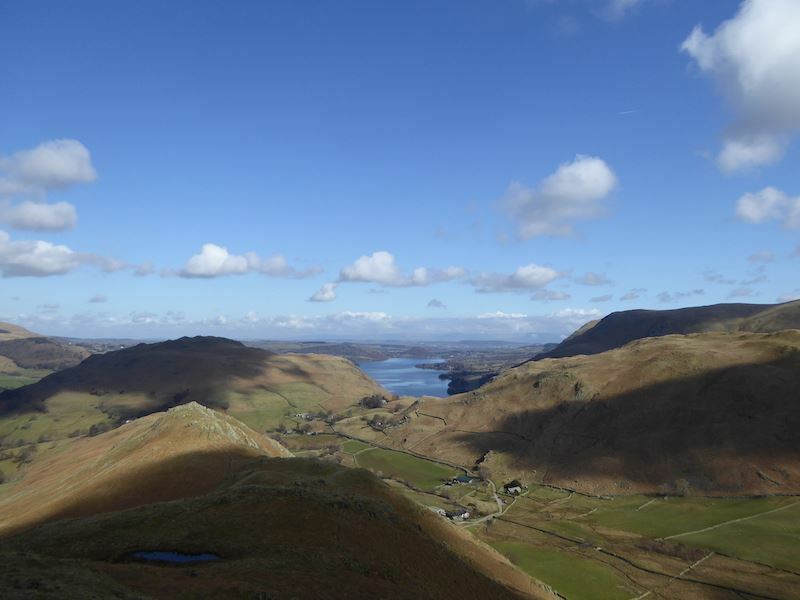 From Winter Crag a look down to the valley bottom and Ullswater. 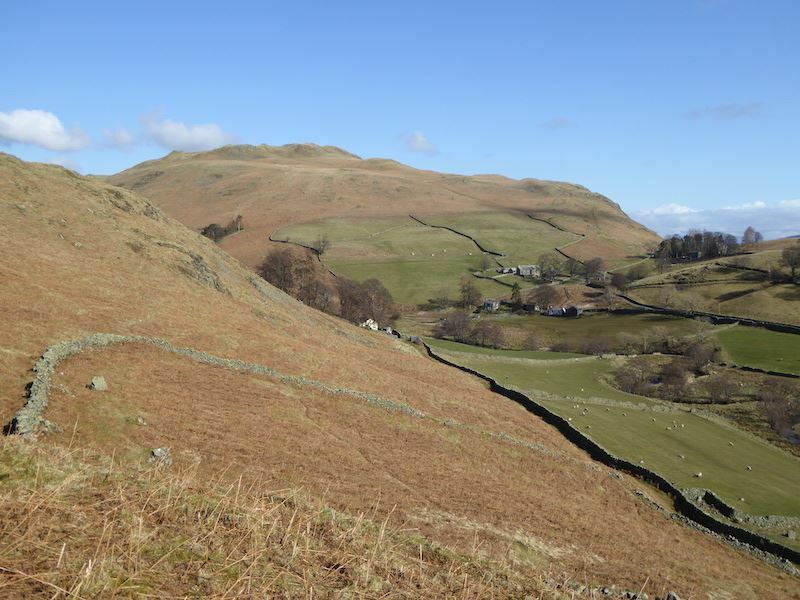 The restored beacon on Hallin Fell can be seen quite clearly today. 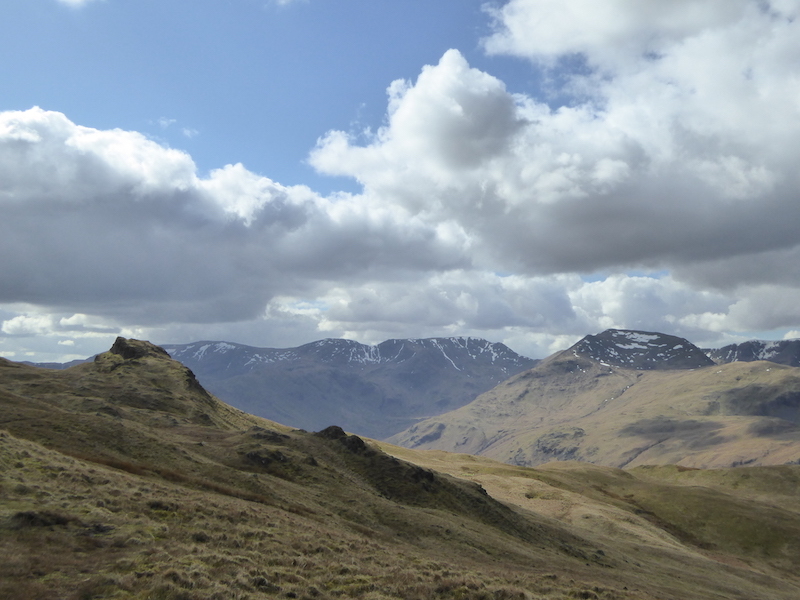 Looking across Boredale to Place Fell. 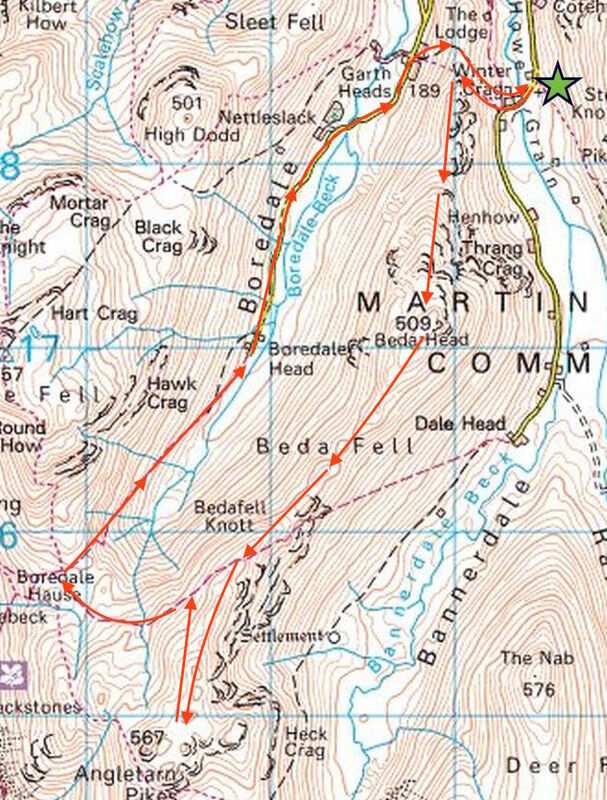 A look back at Winter Crag and the path we have been following. 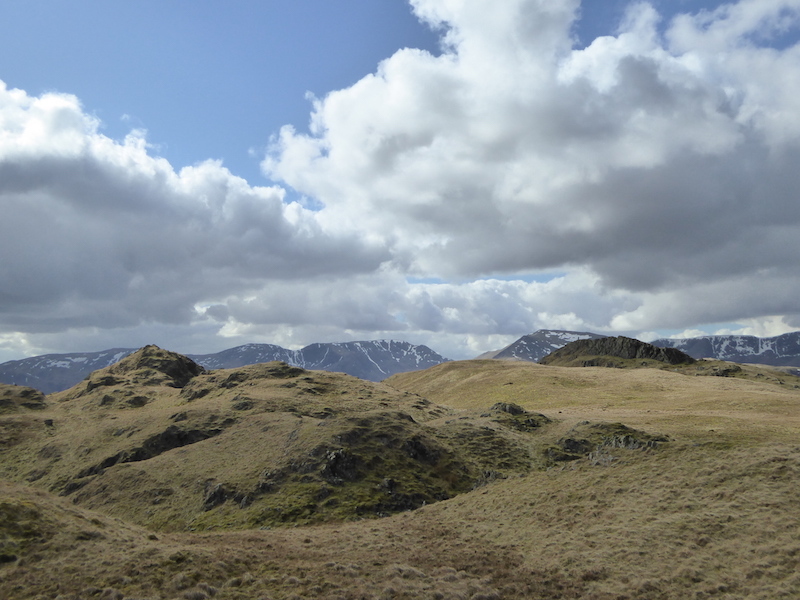 Little Mell Fell again on the left . 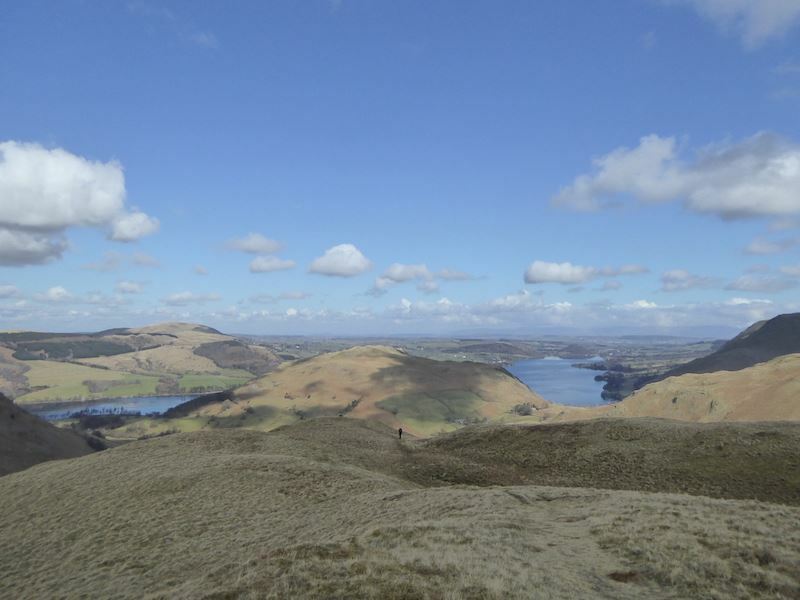 A longer view of the route we’ve walked so far, looks like somebody’s turned the lights off on Hallin Fell. 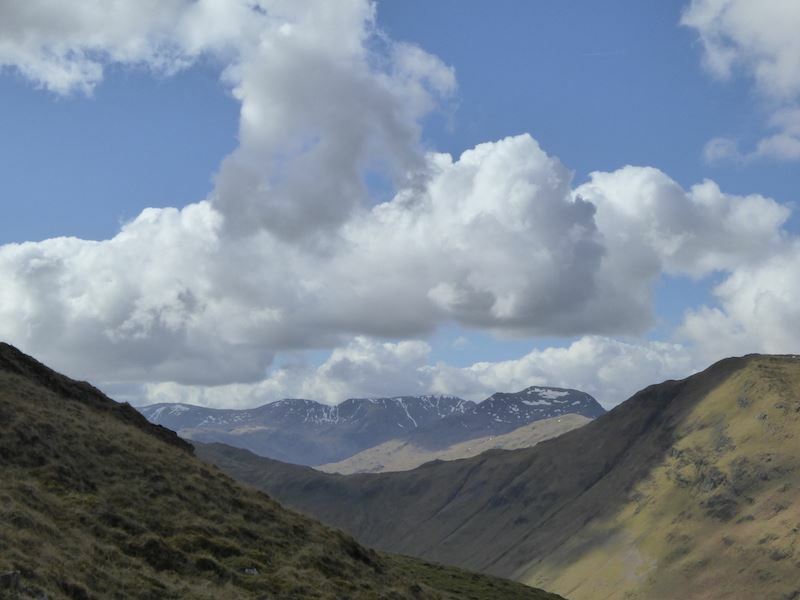 A bit further on and we get some cloud cover too, as does Steel Knotts and Bonscale Pike beyond it. Steel Knotts isn’t completely cloud covered just yet but Bonscale Pike behind it is. 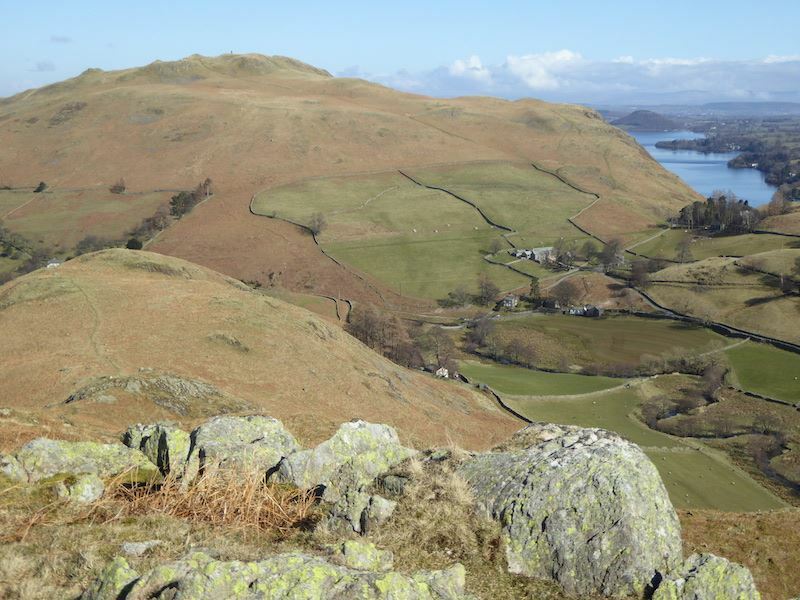 Two views of Ullswater from further along the ridge. Another walker coming up behind us, more about him later. 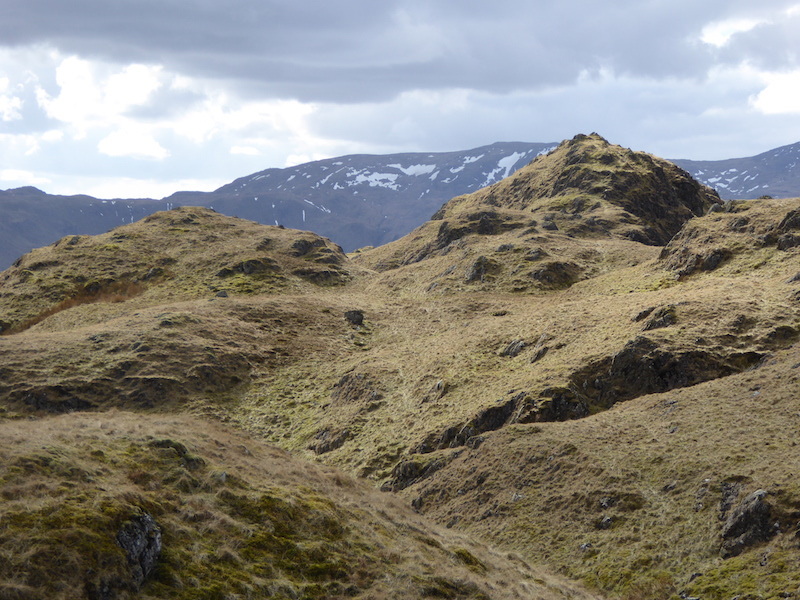 Looking ahead, Saint Sunday Crag still has some large snow patches, as does Fairfield just to the left of it. The clouds are starting to look fantastic. 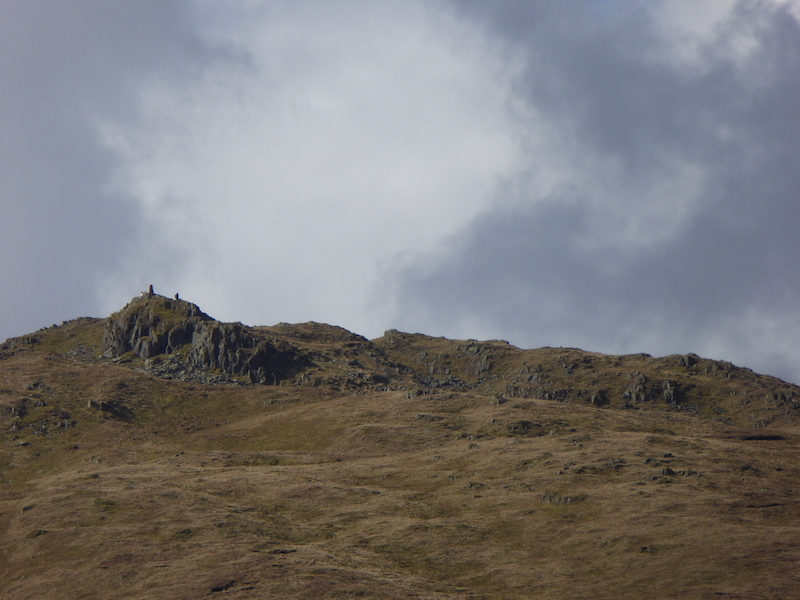 Zooming in on Place Fell summit which now has a walker on it. 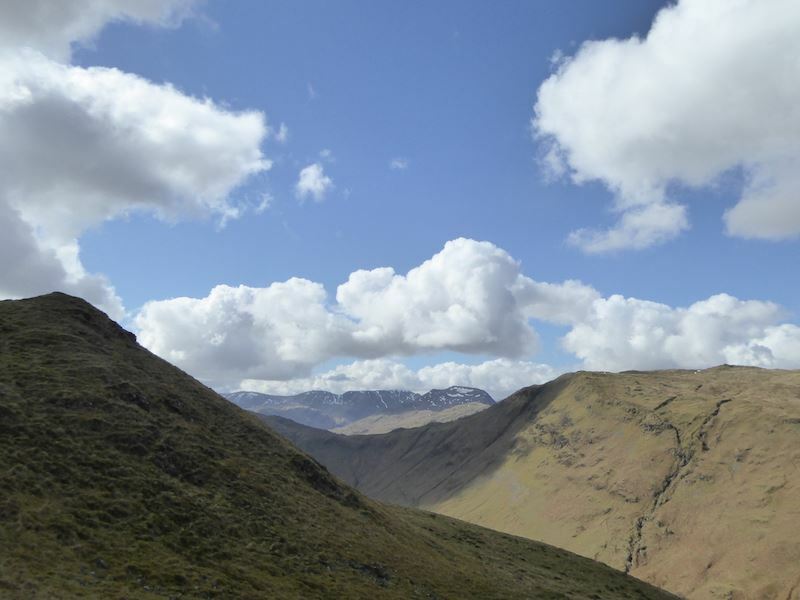 We still have a decent patch of blue sky as we continue along the ridge with Place Fell in the sunshine on the right. 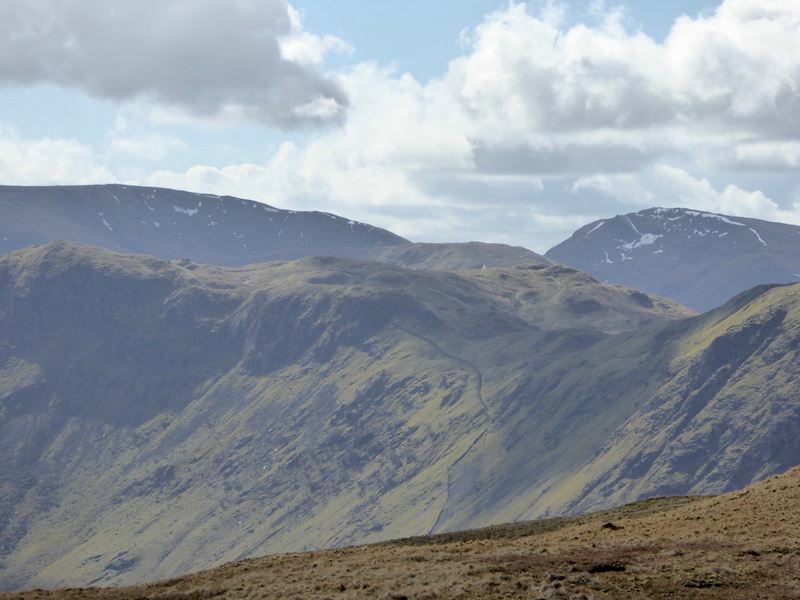 Ahead of us is Fairfield on the left, St Sunday Crag is next, then comes Dollywagon Pike and after that is Nethermost Pike. 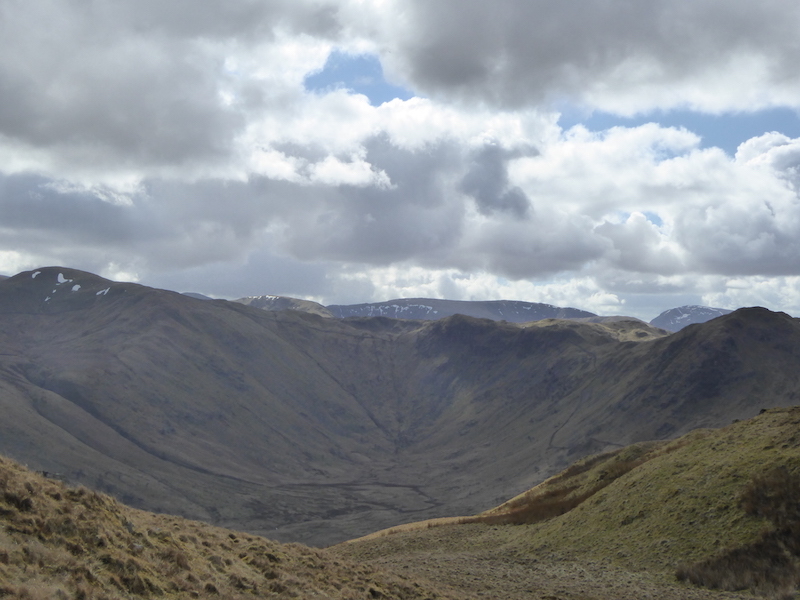 The big chunk of fell to the right is part of Place Fell. 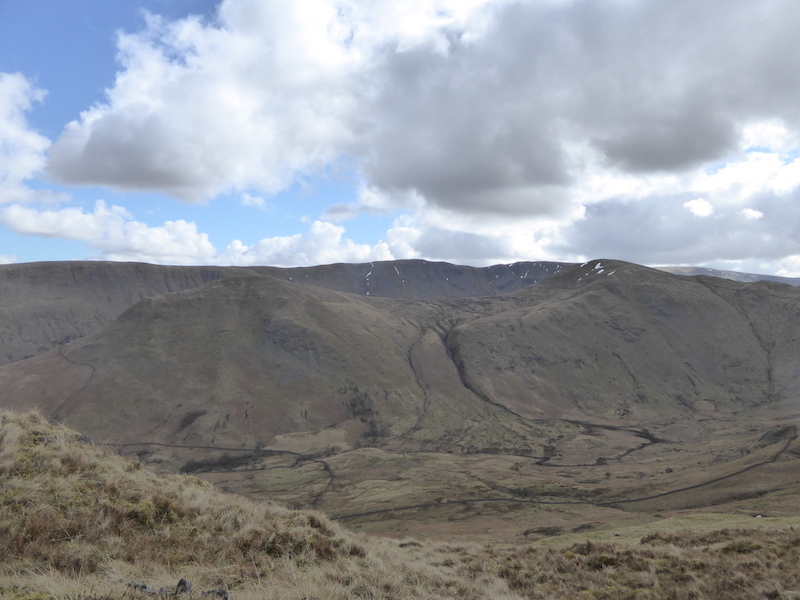 Looking along Beda Fell ridge as we head for Angletarn Pikes, the shaded area in the centre. 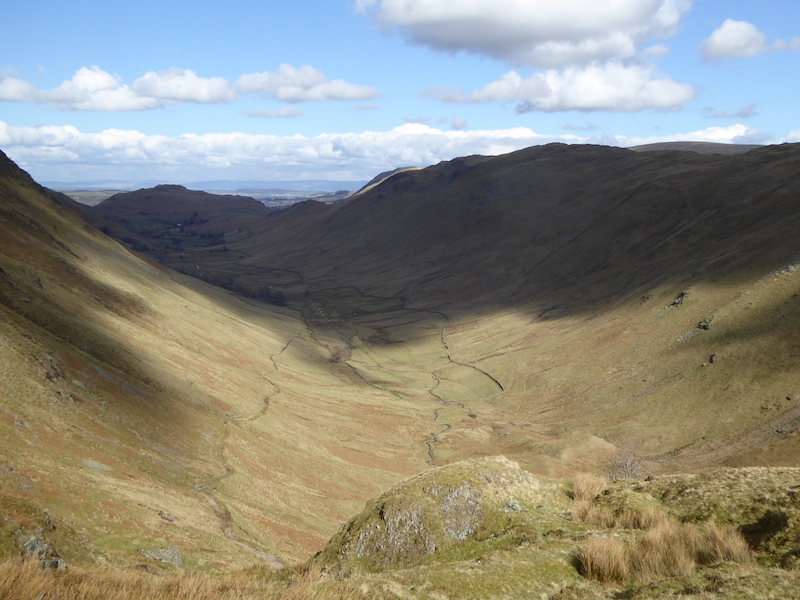 Looking down at the head of Bannerdale. 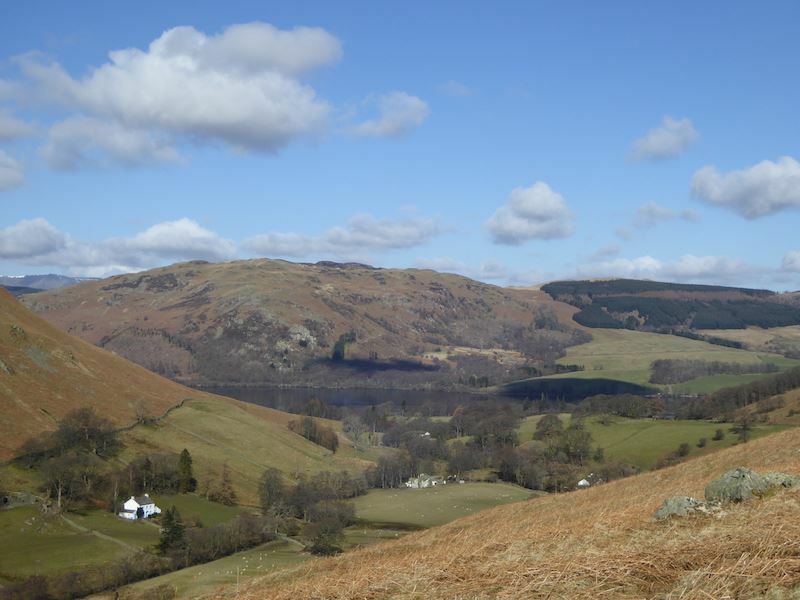 A look back across Ullswater to Little Mell Fell. 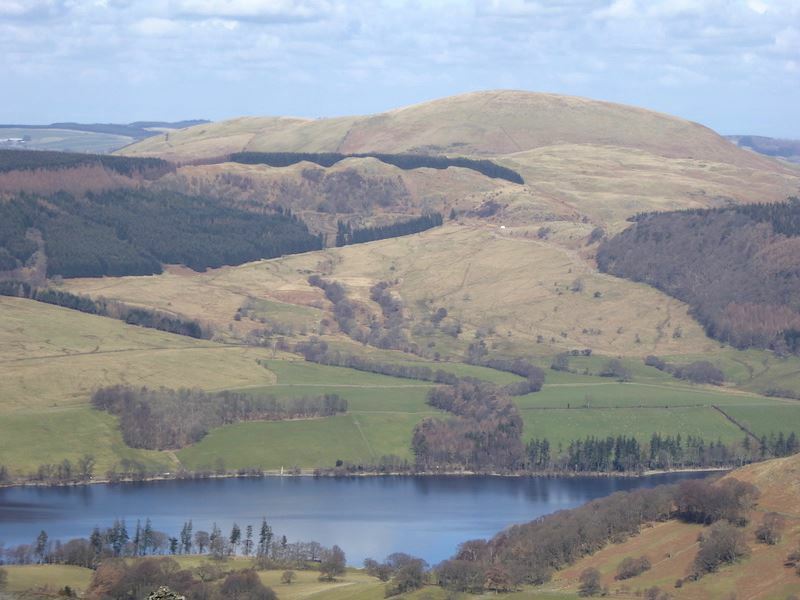 Also behind us is a view of the distant Pennines across Ullswater. The fell in deep shadow on the skyline behind us is Great Mell Fell. 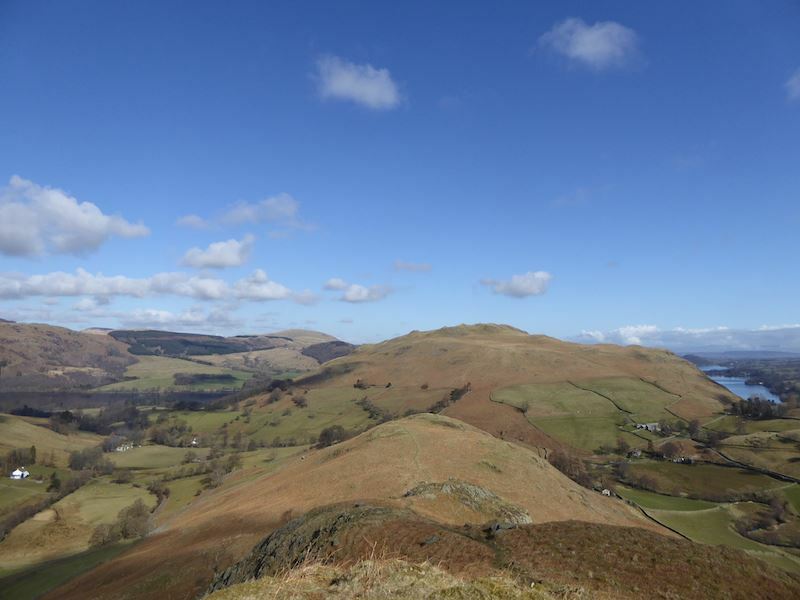 Little Mell Fell is over on the right of the skyline. 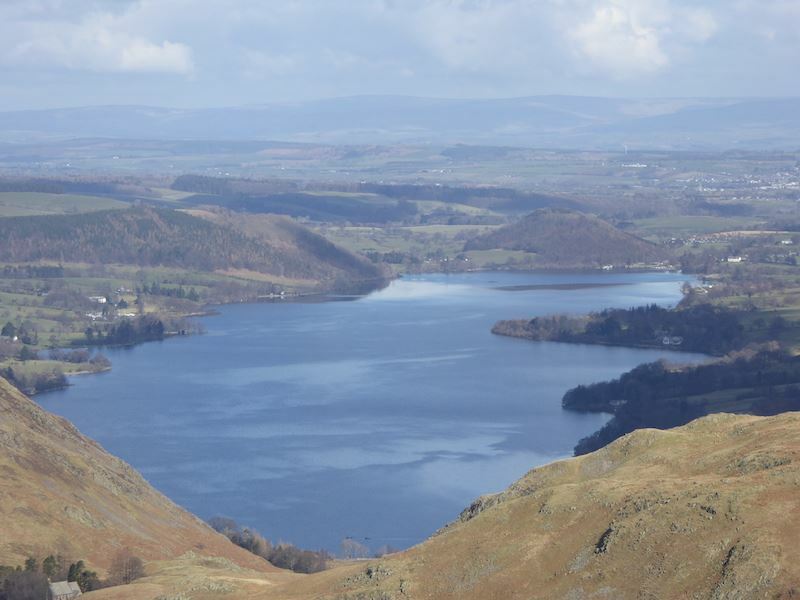 Good view of Ullswater from the summit of Beda Fell. From the summit we continue walking along the ridge. I mentioned earlier a walker coming up the path behind us and we kept passing each other all the way along, when either he or we stopped for a drink or to take a photo. He was carrying a huge and bulging rucksack so we assumed he was on a wild camping trip for a few days. To be continued. 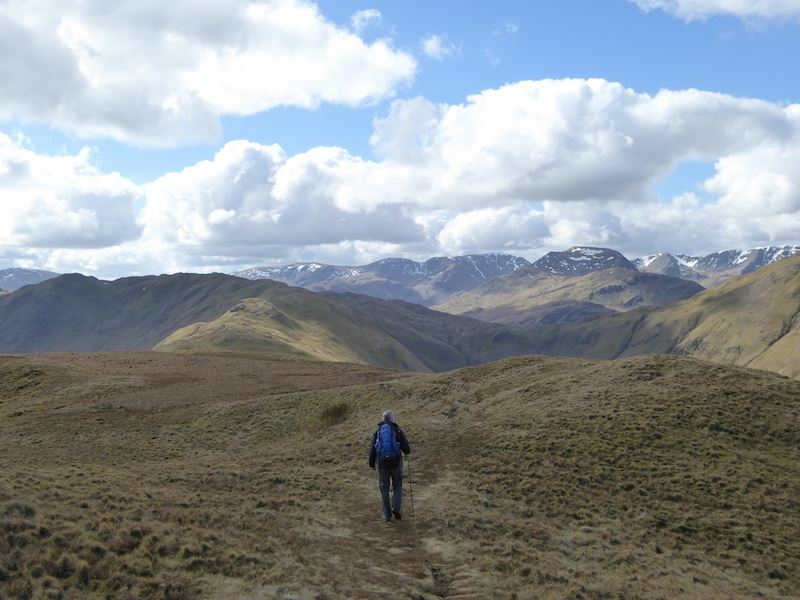 The ridge isn’t all flat walking, there are lots of ups and downs. 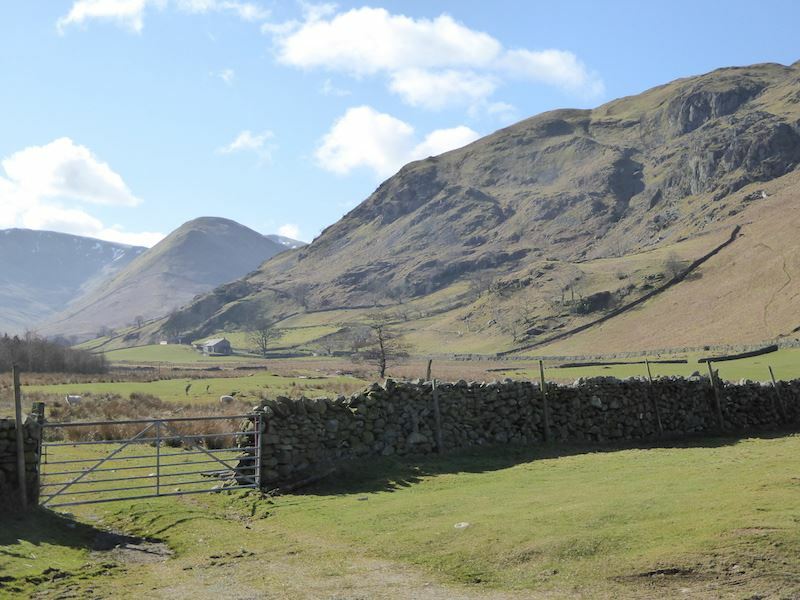 There’s a good view into Boredale though. 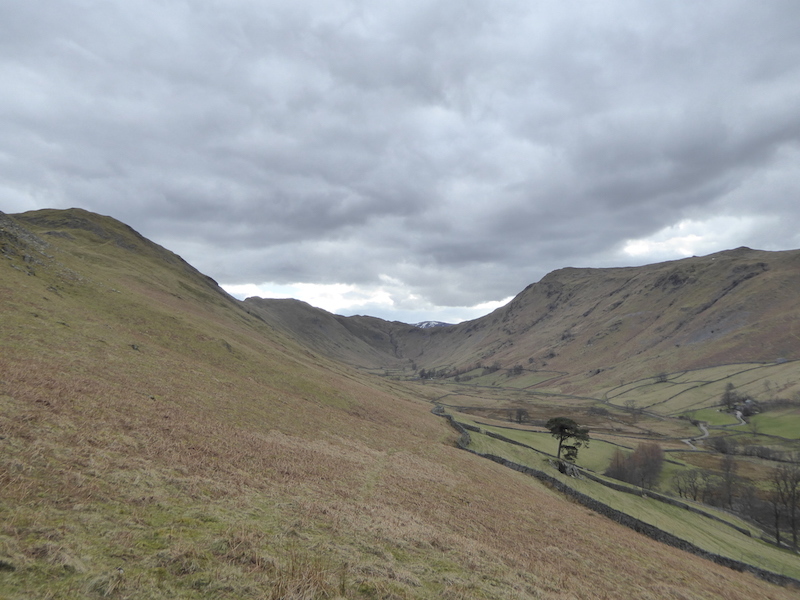 Over on the other side is just as good a view of the head of Bannerdale although the cloud cover did spoil it a bit. It was around this point where we caught up with the lone walker once again. He had downed rucksack and was having a bite to eat and we stopped for a bit of a natter when we reached him. We were surprised to learn that he was not on a wild camping trip at all and that he was just out for a morning walk. 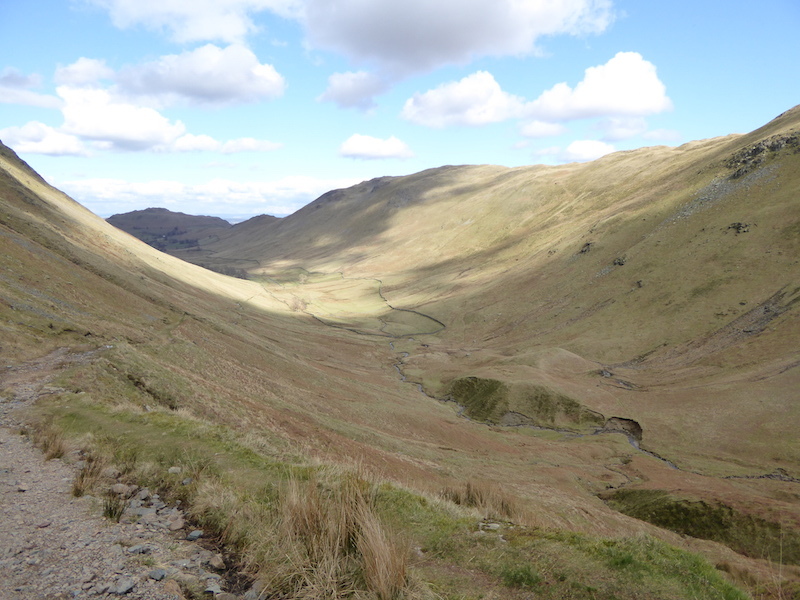 After his lunch he was going to leave the ridge path, drop down into Bannerdale and return home. He lived locally too. Why anyone would carry so much stuff just for a morning walk left us a bit puzzled. 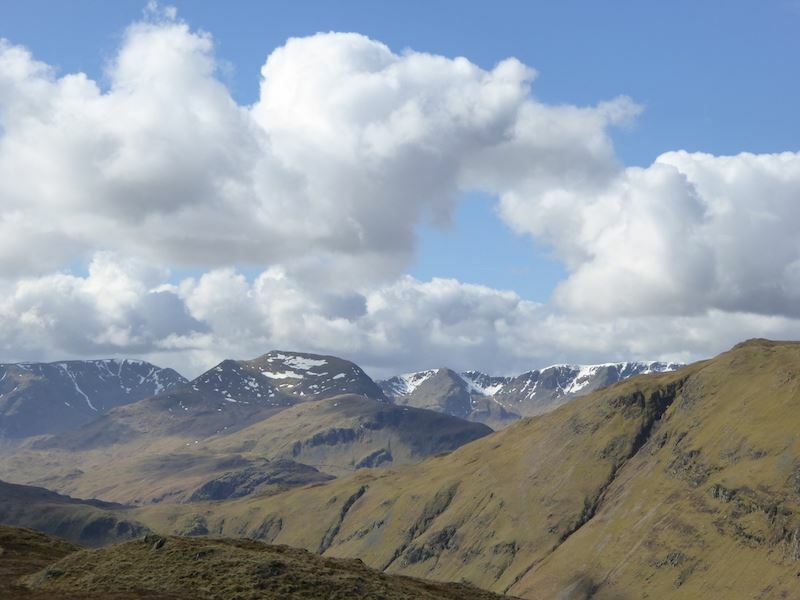 Over on our right there’s a good view of Saint Sunday Crag with Birks below it, and Arnison Crag below that. 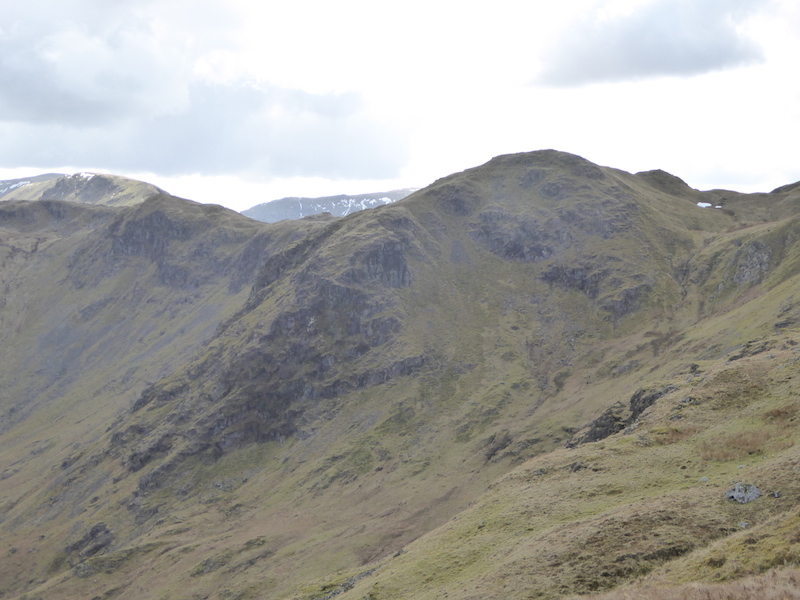 A look back along the ridge to Beda Head. We now have a lot of cloud over us and the blue sky is going over to the east. 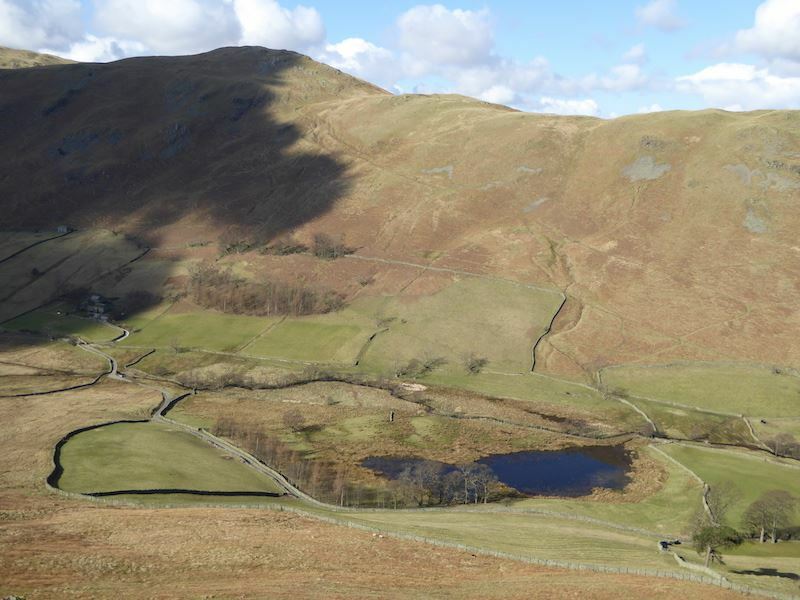 The lone walker with the very large rucksack should be well on his way down to Bannerdale by now. Heck Crag at the head of Bannerdale. 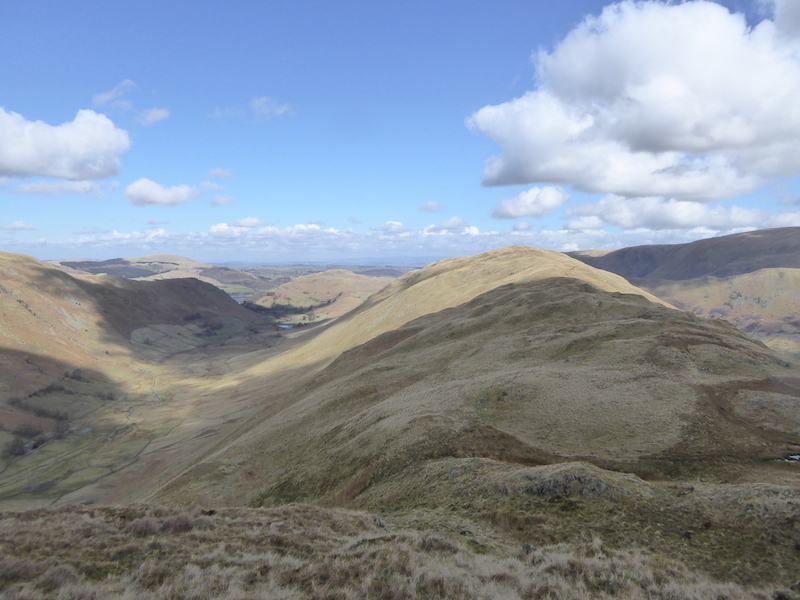 Looking across Bannerdale to The Nab and Rest Dodd. Between the two on the centre skyline is High Raise. 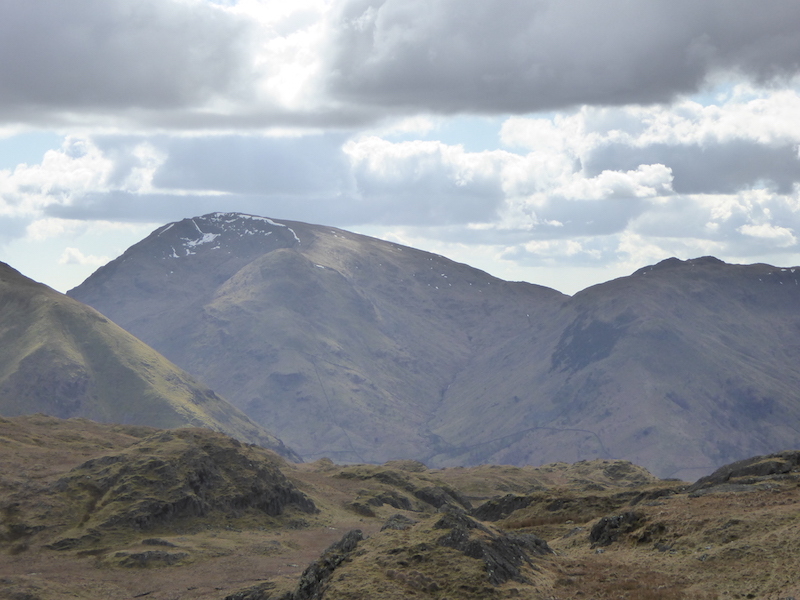 On the left is the higher of the two peaks of Angletarn Pikes with Saint Sunday Crag opposite it on the right. 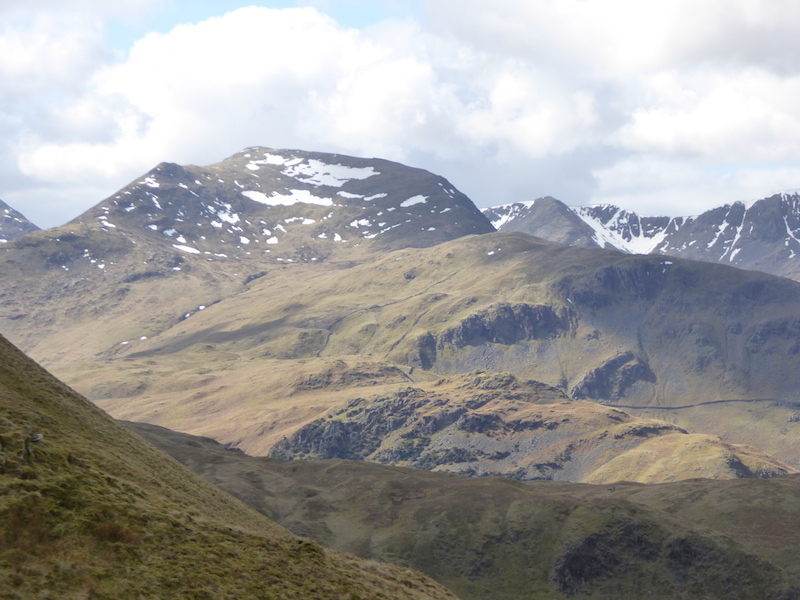 Now both peaks of Angletarn Pikes are in view, the lower peak being on the left of the photo. Zooming in on the higher peak, with a walker taking a photo from his vantage point. 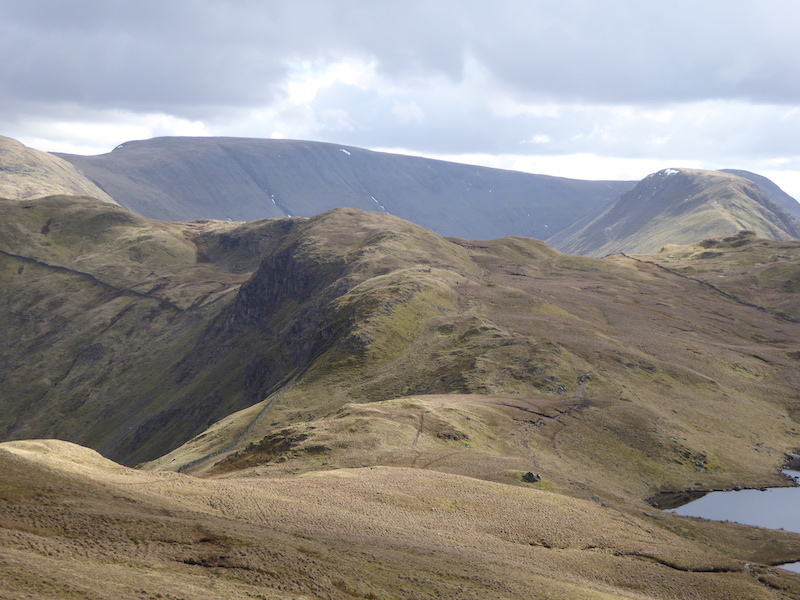 The lower peak of Angletarn Pikes. We’ve still got sun but there’s some heavy grey cloud building up across there, hmm. 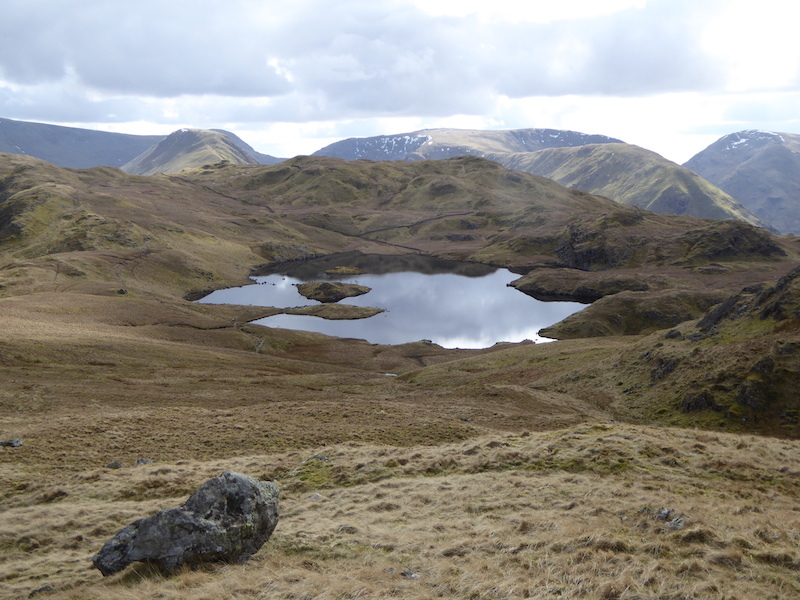 A lovely spot for a lunch break with a view of some of the far eastern fells across Angle Tarn. 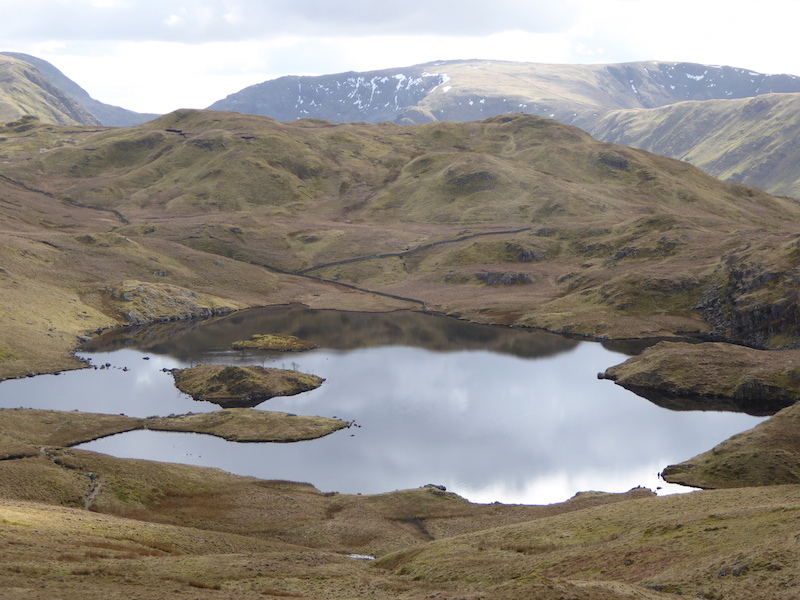 The grey cloud reflected in Angle Tarn but there’s not a ripple on the water. From our lunch spot there’s High Street on the horizon with Gray Crag to the right. 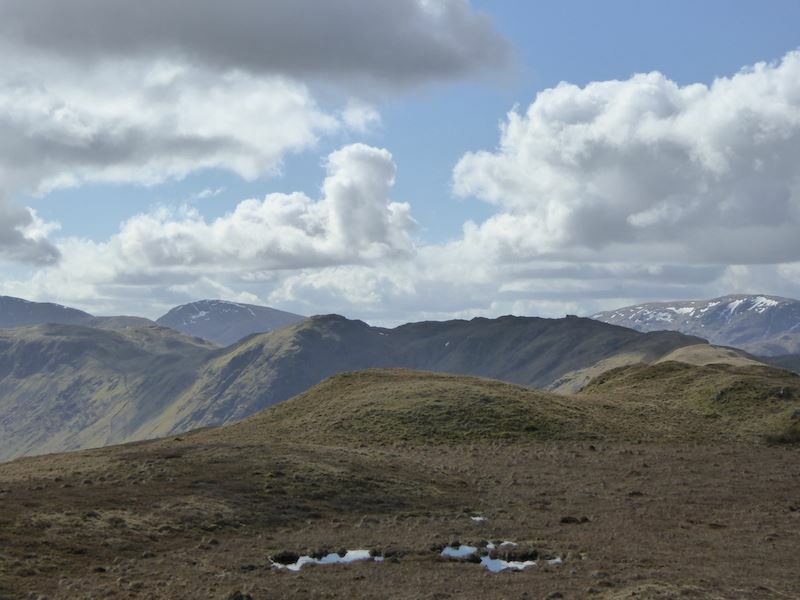 Also from our lunch spot, Red Screes towards the left, Middle Dodd in front of it. 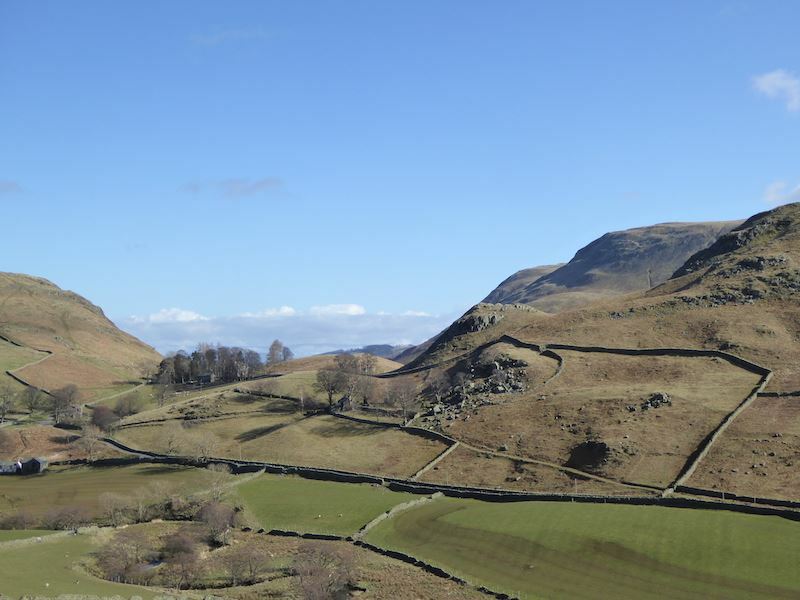 To the right of them is High Hartsop Dodd and above that are the lumps and bumps of Little Hart Crag. 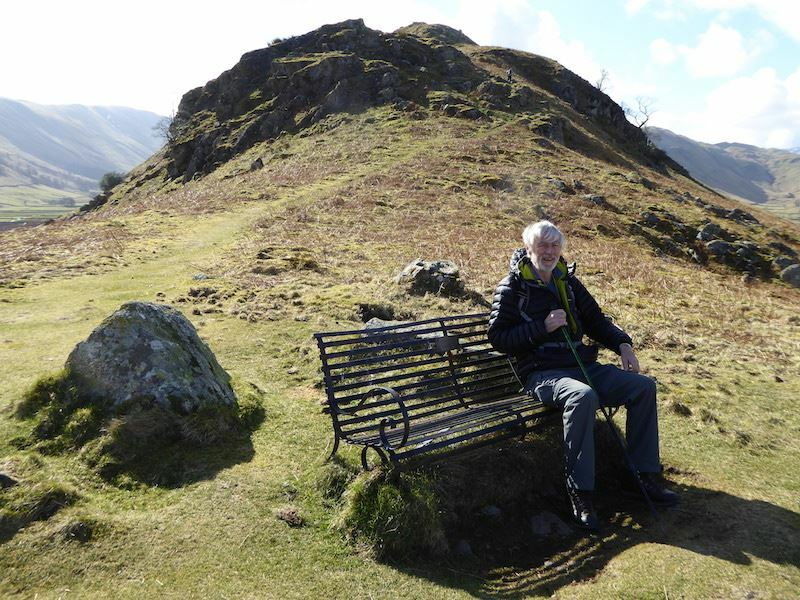 We make our way to Boredale Hause after lunch. 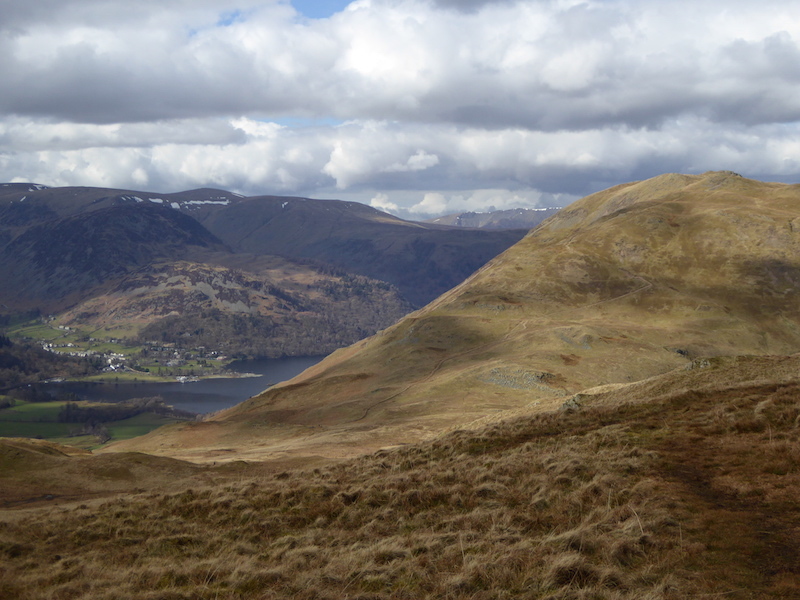 Ahead of us Place Fell and Glenridding by Ullswater have a splash of sunlight, everything else was out of luck. 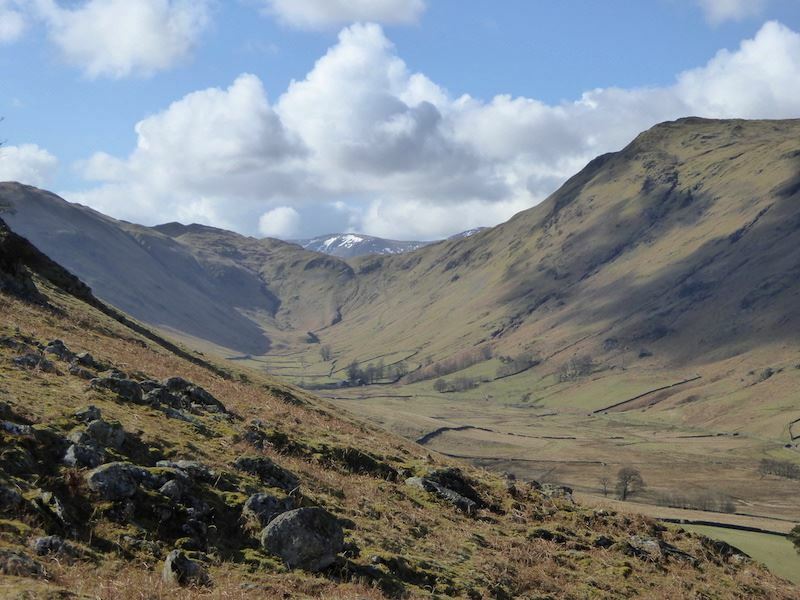 Looking down Boredale with the Beda Fell ridge on the right now in deep shade. The grey cloud was above us all the way down Boredale with the sunshine always just tantalisingly ahead of us. We’re down on the valley floor now and completely in the shade. 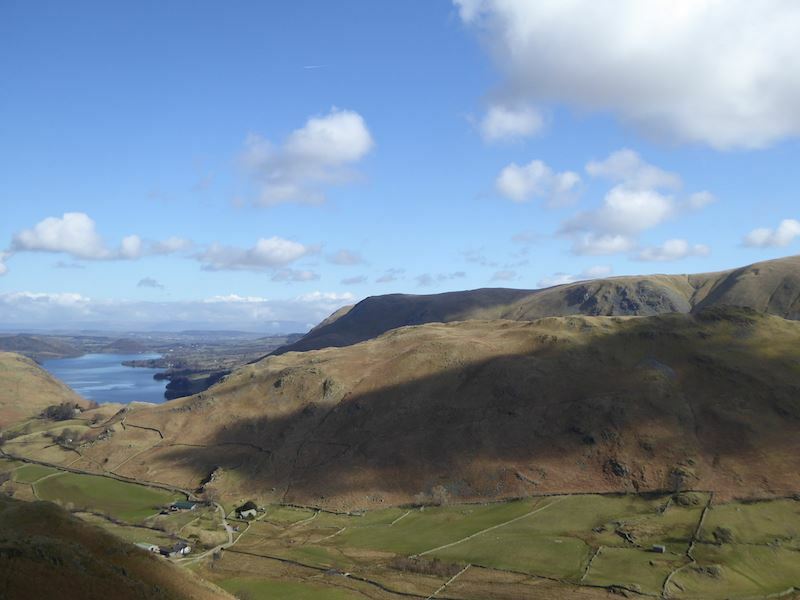 Directly in front of us is Hallin Fell with Winter Crag over on the right. 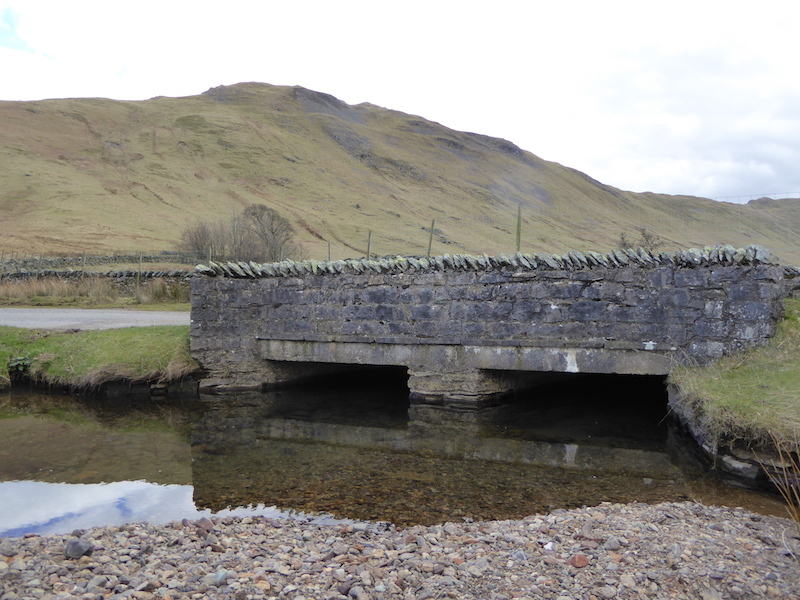 The bridge over Boredale beck with Beda Fell behind, the car is parked on the other side of it so there’s a bit more up to deal with before we reach it. 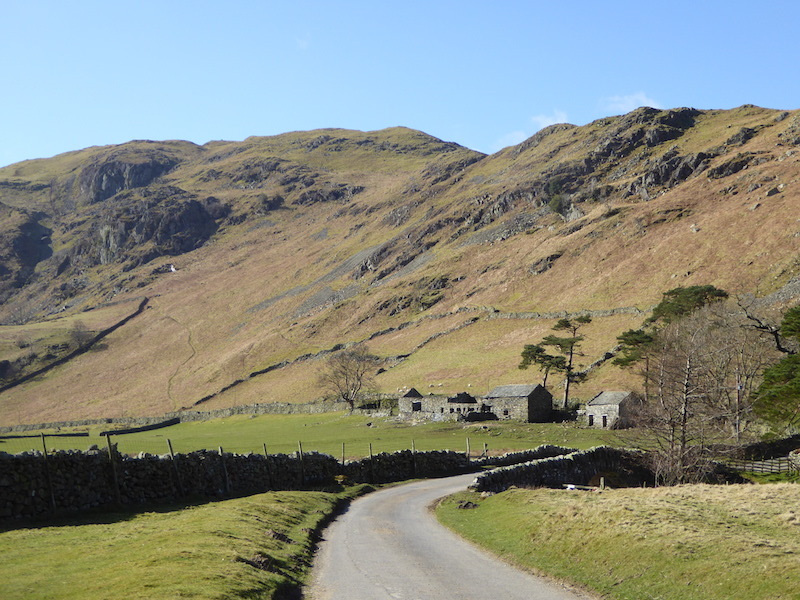 The last little bit of up as we climb out of Boredale over into Martindale. 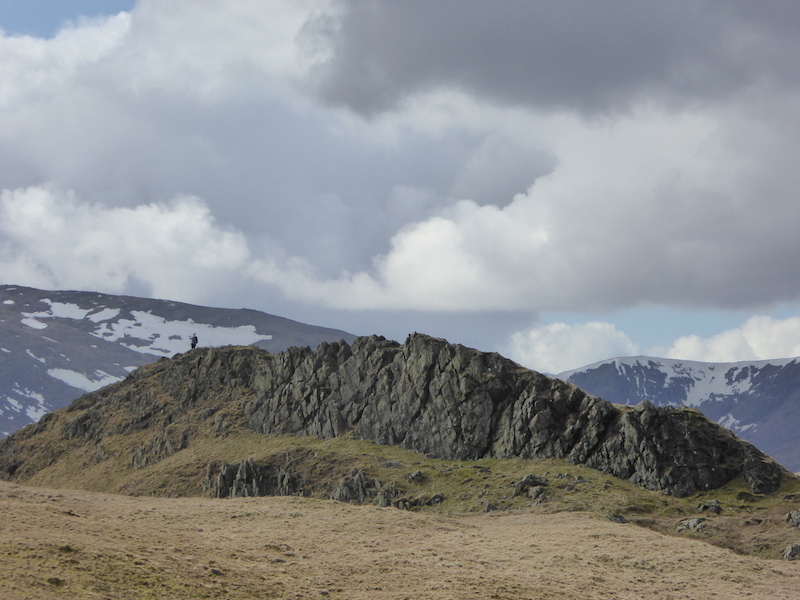 Above is that large mass of grey cloud which has followed us all the way from Angle Tarn. At least it didn’t dump its contents on us.